A representative team of seven fly fishermen from across Northern Ireland will travel this weekend to Devon, England to prepare for and take part in the XVI Commonwealth Fly Fishing Championships. The NI team members have all qualified through local competitions organised by the Trout Anglers Federation of Ireland (T.A.F.I. ), to represent Northern Ireland in this bi-annual competition. 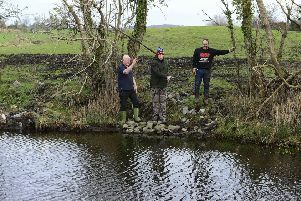 This is only the second time a Northern Ireland team has been represented in the Commonwealth Fly Fishing Championships. The team is hoping to build on their last performance in Tasmania in 2012, when the NI Team finished third, taking the team bronze with Campbell Baird claiming an individual second place. The team travelled to Devon few weeks ago to practice techniques and try out the competition venues. Commenting after the practice weekend, Alan McDade, Team Manager and Captain said, “Some really worthwhile practice sessions in Devon and Cornwall. This year’s Championship will be a tough competition with strong male and female teams competing from South Africa, New Zealand, Australia, England, Scotland, Wales, Isle of Man and Canada. Fly Fishers – Campbell Baird (Carrickfergus), Harry McAteer (West Belfast), Brian Kerr (Craigavon), Dominic McAtamney (Kilrea), Kenneth Ferguson (Newtownabbey) and Darren Wallace (Carrickfergus).